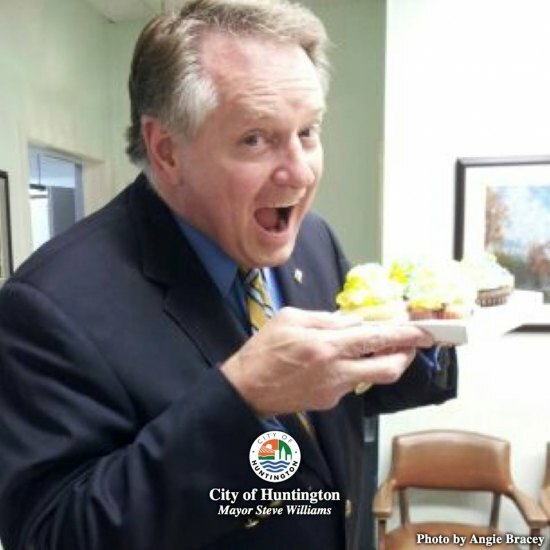 Mayor Williams eating gold and blue cup cakes. Favorable fallout continues from the mistaken blue and gold WVU paraphernalia “ban” which surged viral over the internet. Huntington Mayor Steve Williams remained ecstatic telling the Thursday City Council work session that his Facebook response had gathered 33,000 views. Beaming that someone should toss an “illegal procedure” flag concerning the unlabeled satire, Williams said, “We must be doing something good” for that many people to be intrigued by the parody. The story came in a blog posting by “Alligator Jackson”, who lampooned the city’s beautification campaign by adding the WVU support ban. Although not specifically labeled “spoof”, Mayor Williams proclaimed “Alligator” (a.k.a. David Williams, no relation) a “brilliant writer”. That’s not to disregard the seriously irate impact of initial calls after a WVU blog mistook the “spoof” for a “real” ban. “The WVU and MU partisans on the site are still throwing shots at each other", the Mayor said. After the Mayor took to Facebook, the conversation harshness dropped in tone. "Alligator" Williams did write a "sorry" on Facebook for the misunderstanding. However, he noted, "the article was a parody of your recent ordinances that I feel restrict freedoms. I never in a million years figured that anyone would believe them. I am disappointed in some of your actions but you are a good man." Several fans of The Digger blog --- which is known for "Saturday Night Live" styled "Weekend Report" satire --- noted that some people (really) did not know that the site has a predominantly satire reputation.